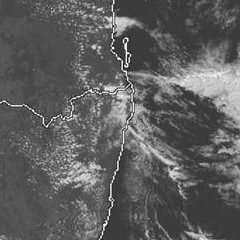 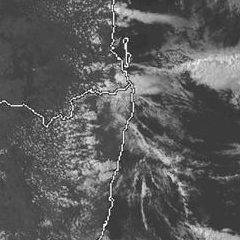 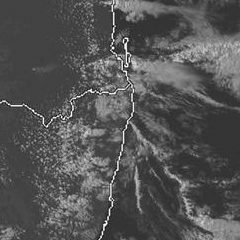 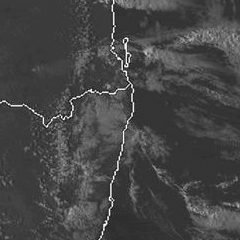 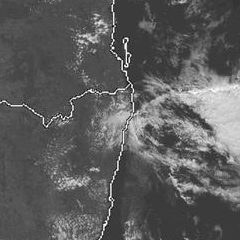 A supercell thunderstorm developed near Rathdowney early afternoon and tracked NE across Mount Tamborine and the Northern Gold Coast. 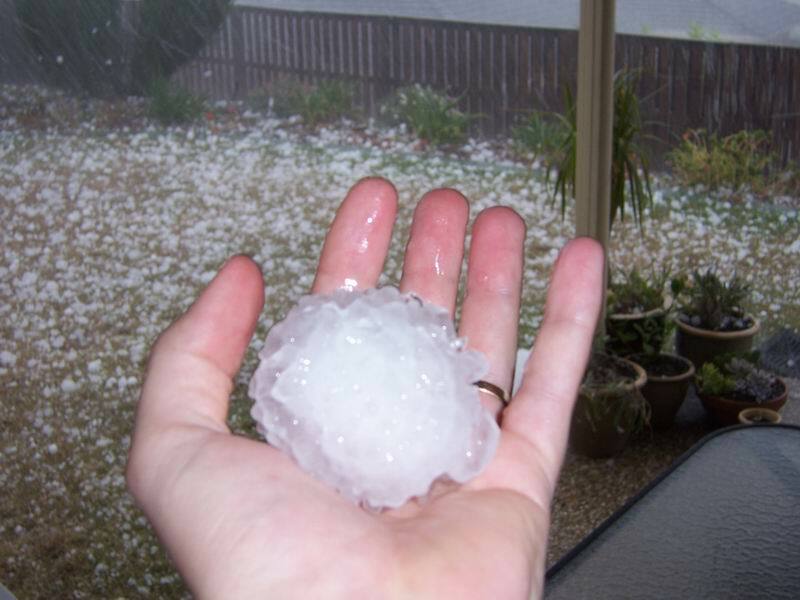 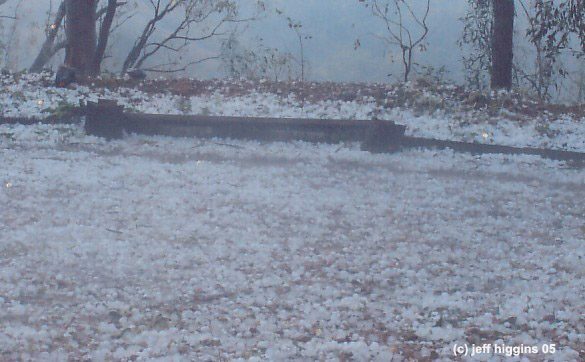 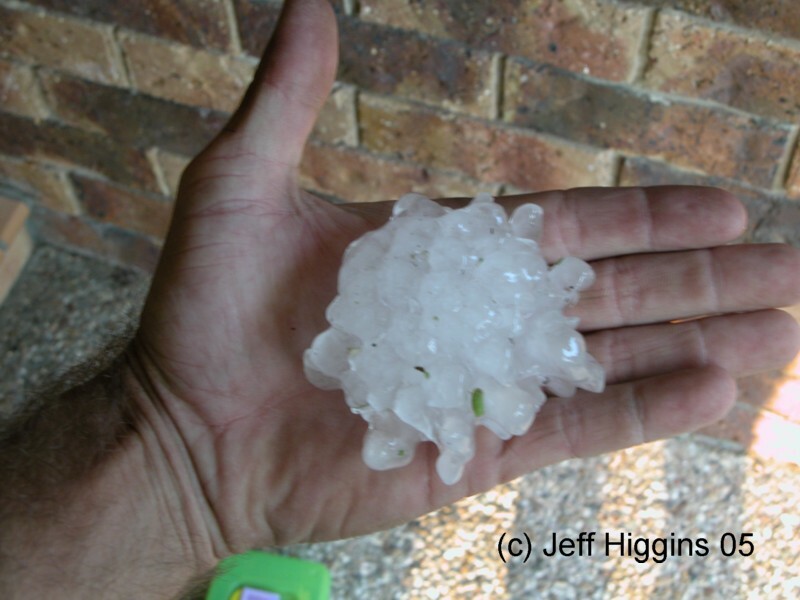 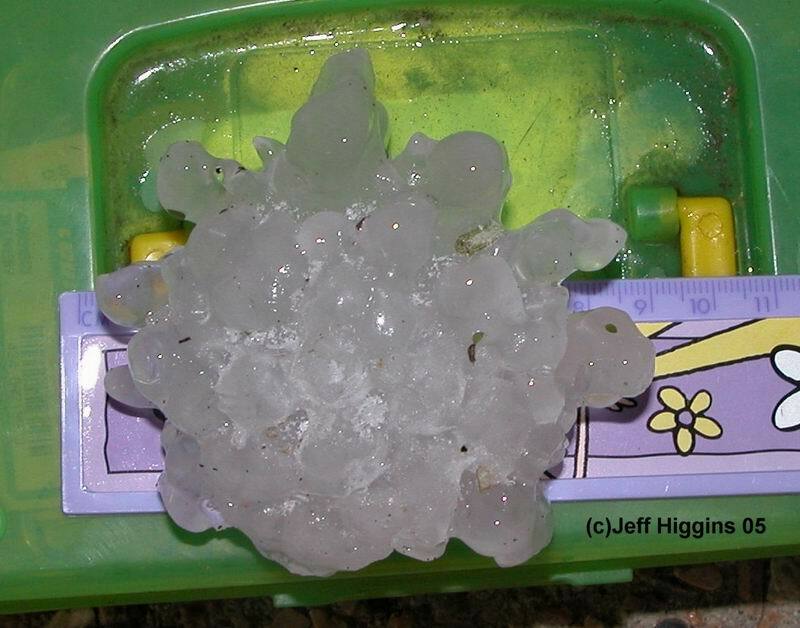 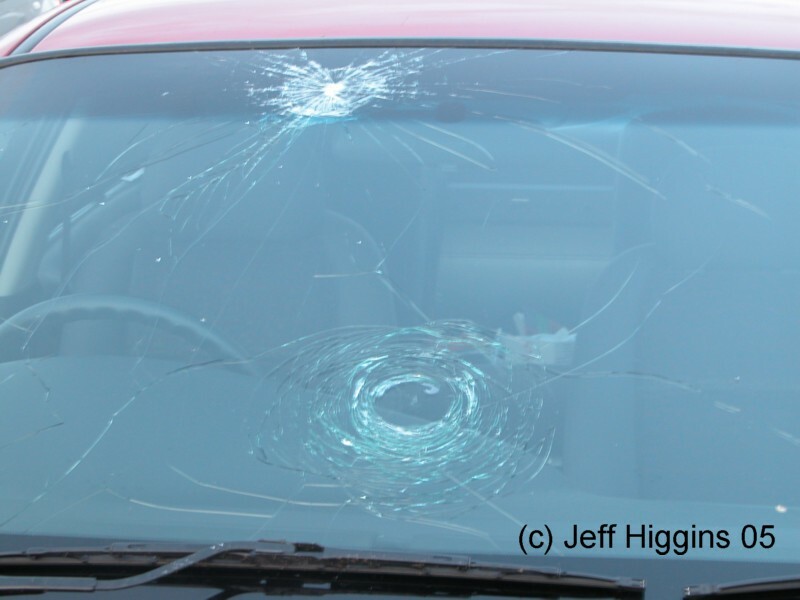 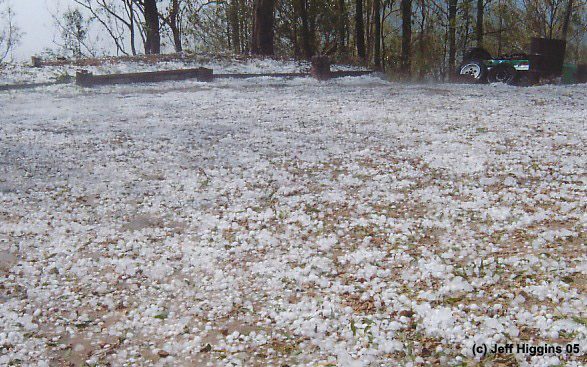 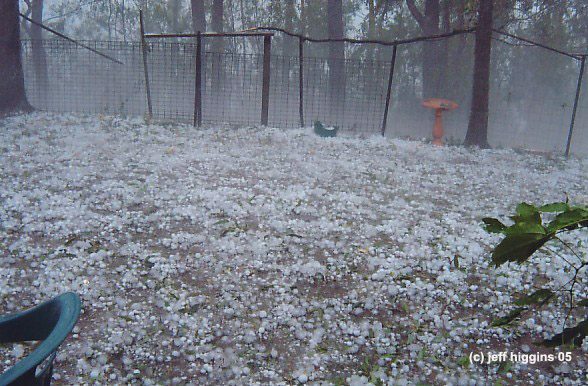 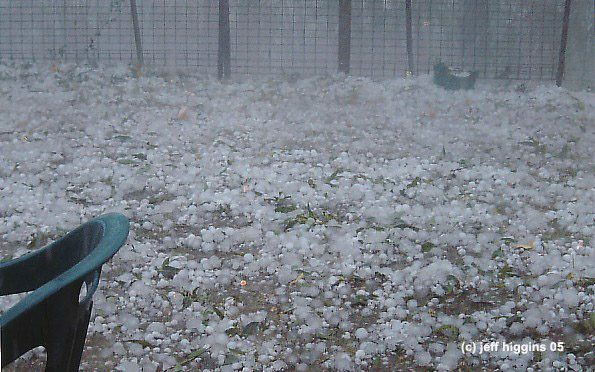 Giant hail damaged many vehicles and property with stones measured to 9cm diameter reported. 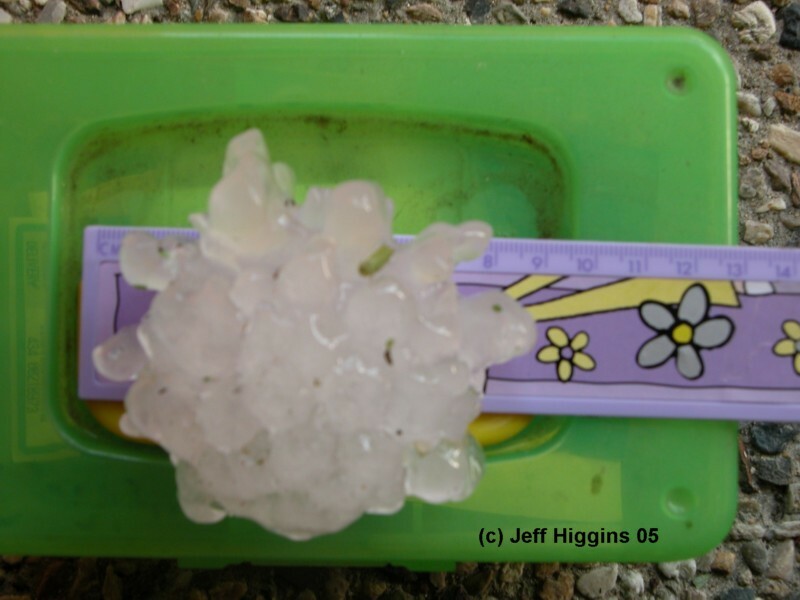 Hail larger than than 9cm is very likely given the damage. 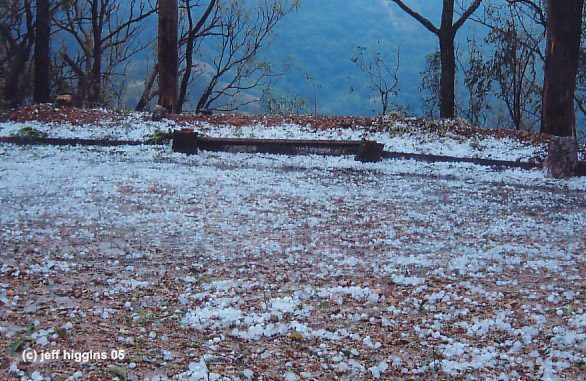 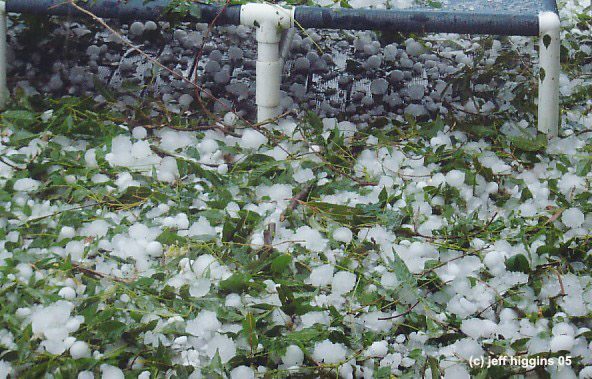 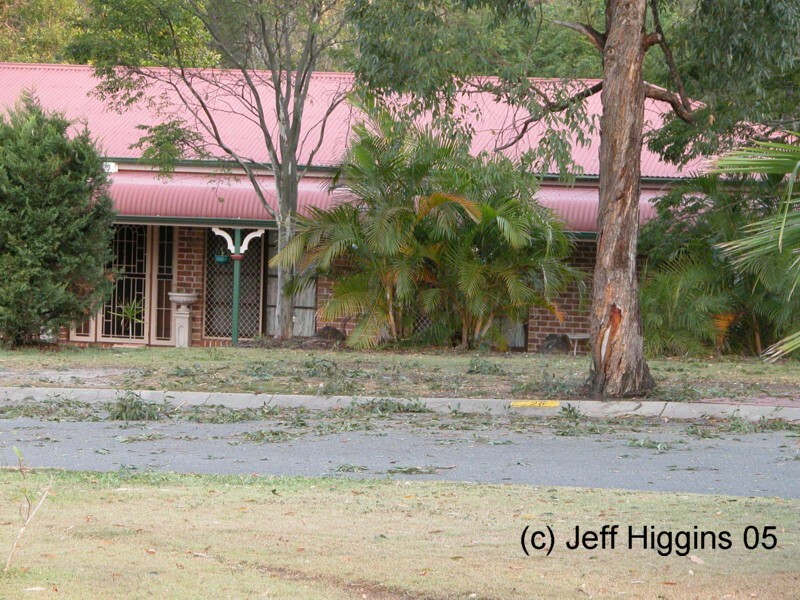 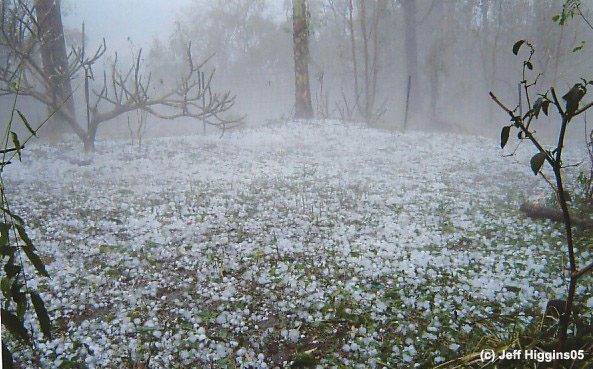 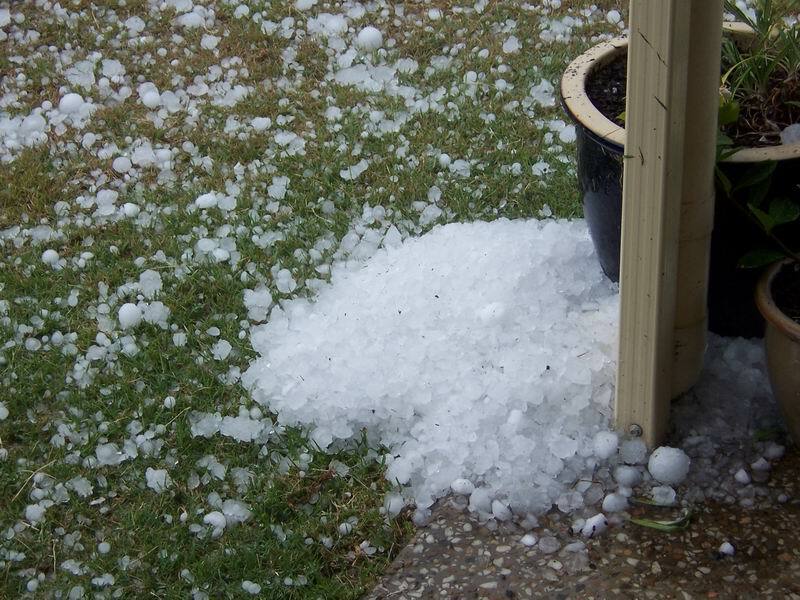 The Queensland State Emergency Service (SES) received over 1,000 calls for assistance to help secure homes damaged by the gorilla hail, mainly at Pacific Pines, Oxenford and Helensvale. 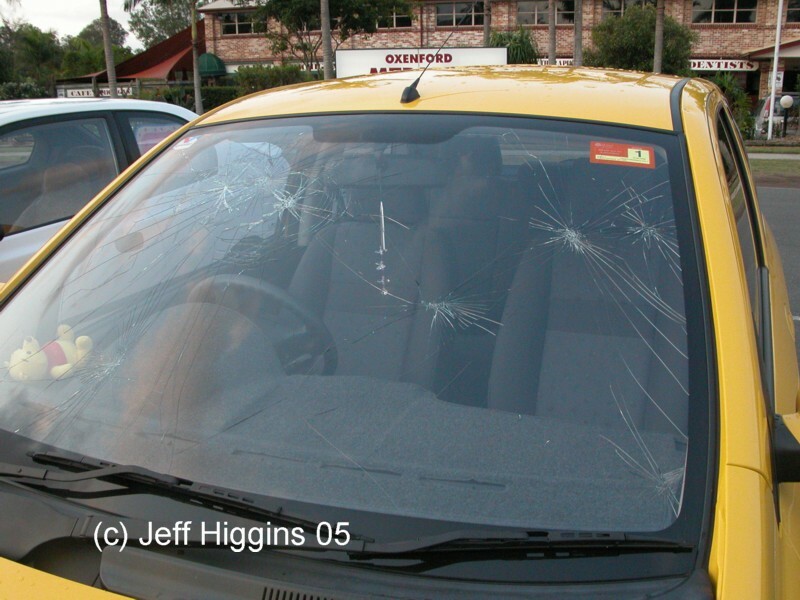 As at 18th October, 6,500 insurance claims with losses totalling $60 million have been reported. 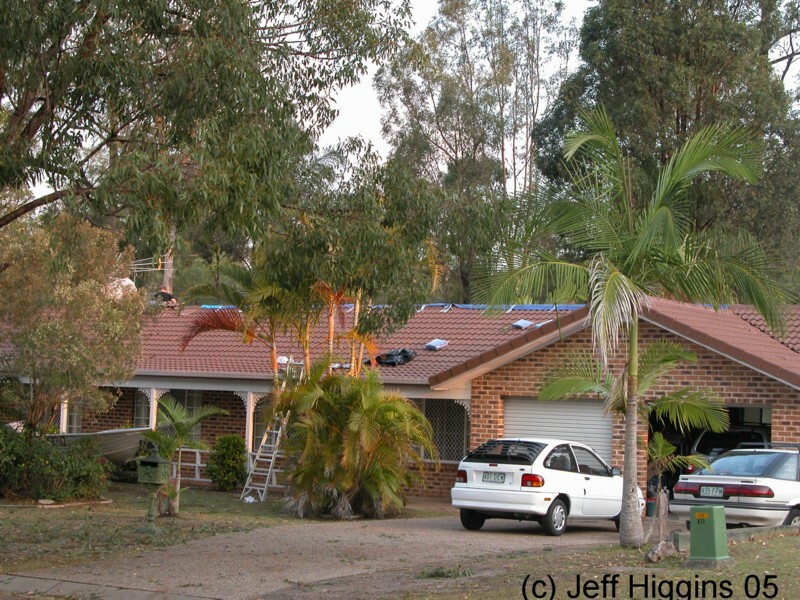 These photos taken by Marty Pouwelse. 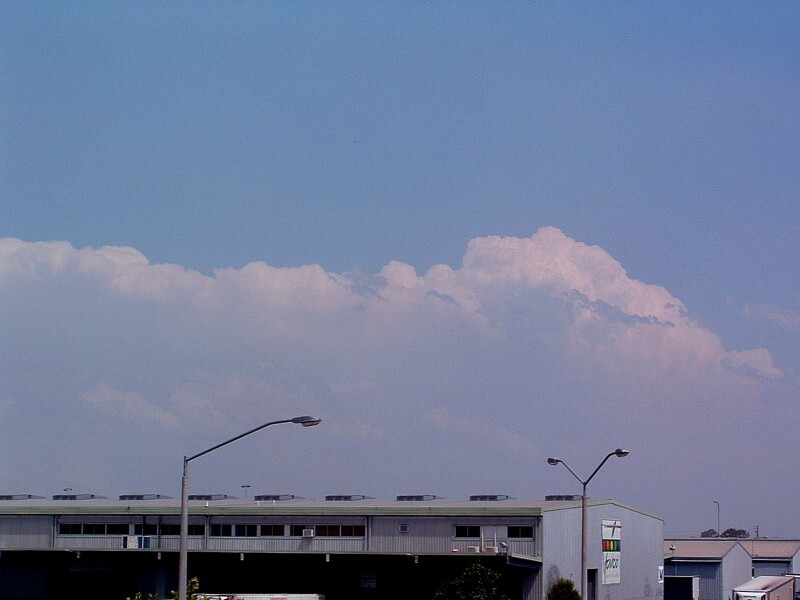 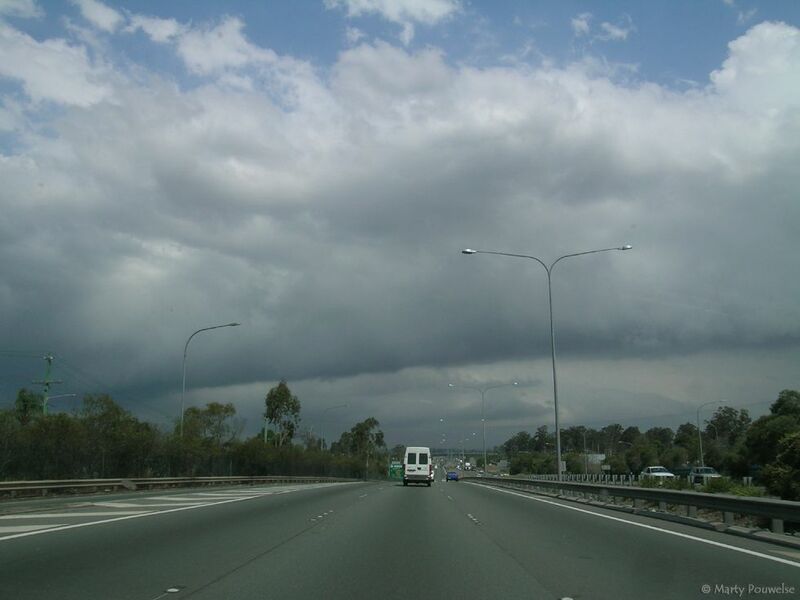 The first shows the view from the north, the second shows a gustfront at Coomera and the third shows the storm after it had passed out to sea. 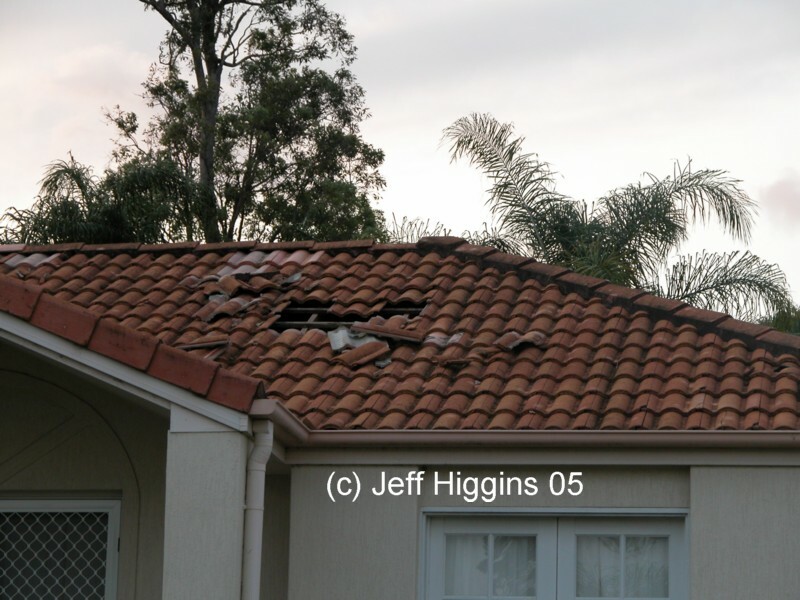 These photos of the Gold Coast storm taken by James Chambers from Brisbane. 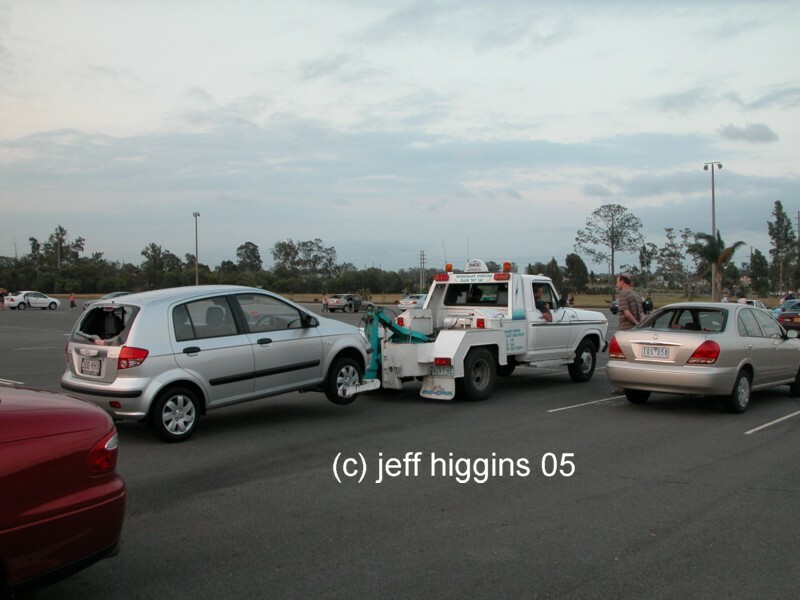 These photos taken by Jeff Higgins. 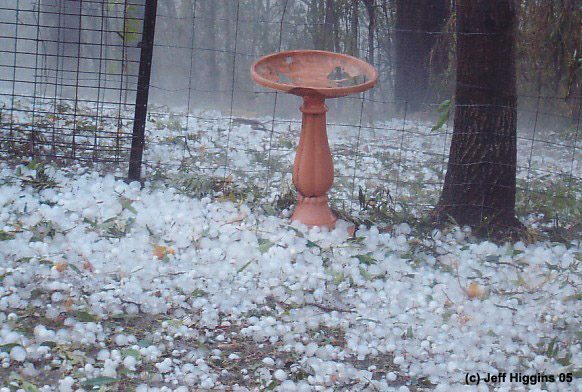 They clearly illustrate how the large hail is made up of many smaller stones that have joined quickly during some process in the storm's development. 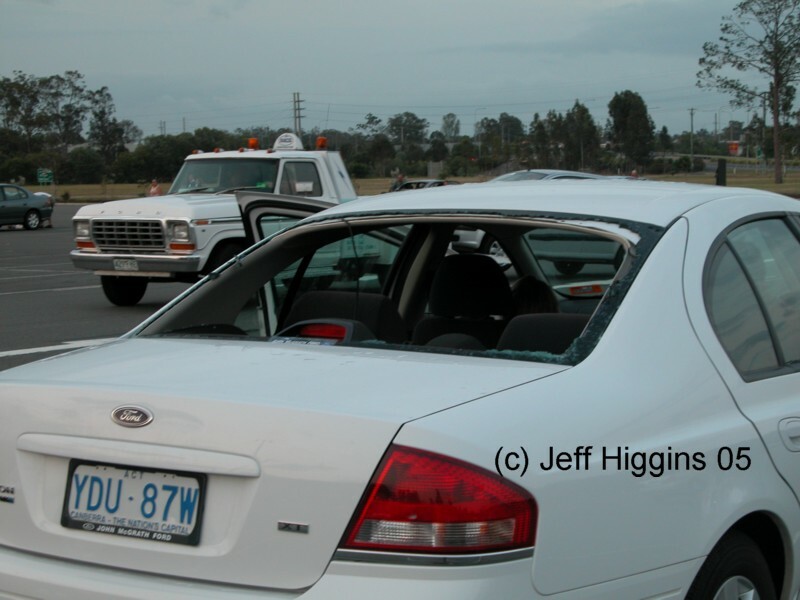 Jeff writes, "the area where the pictures were taken was 2km NW of Pacific Pines in Oxenford (500 metres due west of the Movie World theme park). 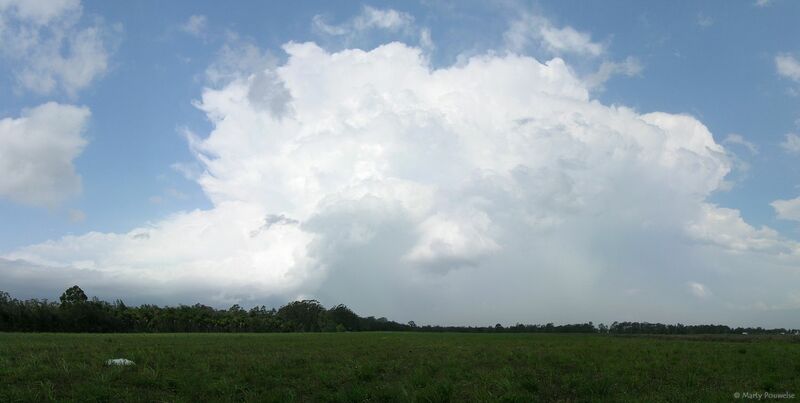 This gives a damage path (at that point) about 3km wide! 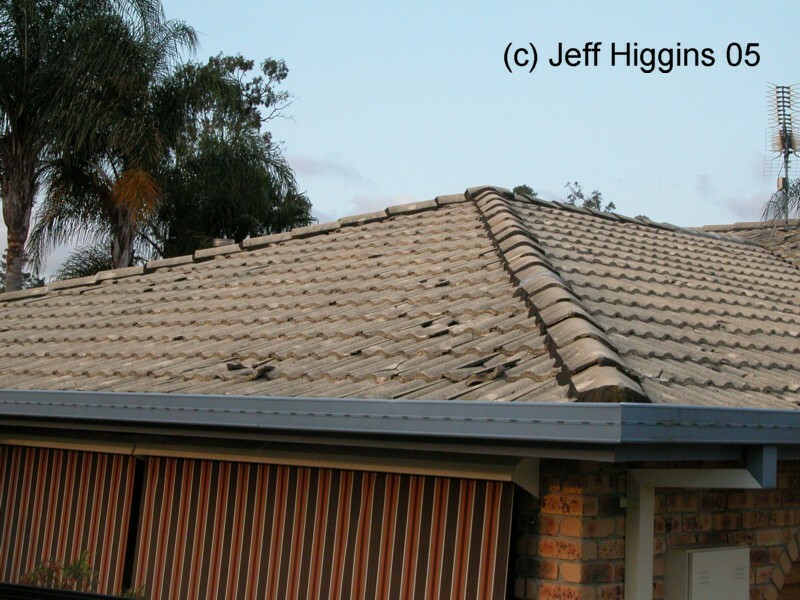 Also the largest amount of damage to house and property was where the 9cm stone was found. 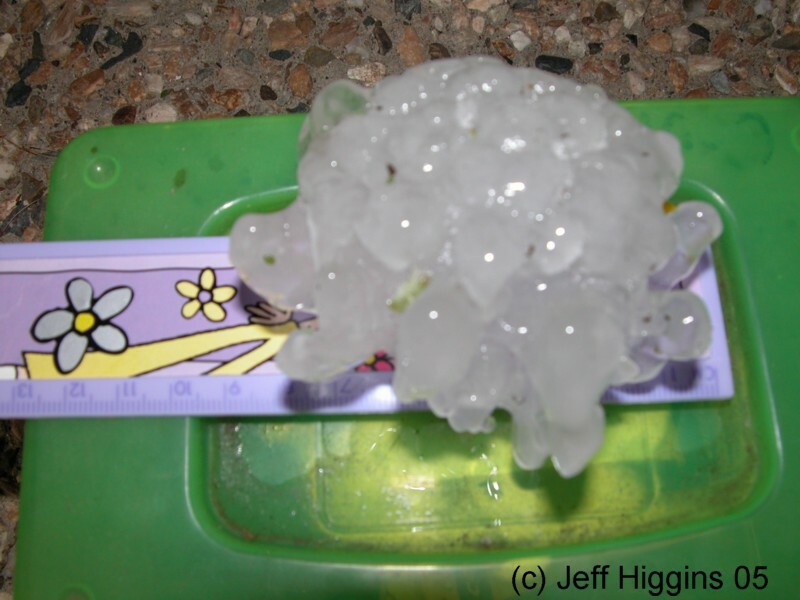 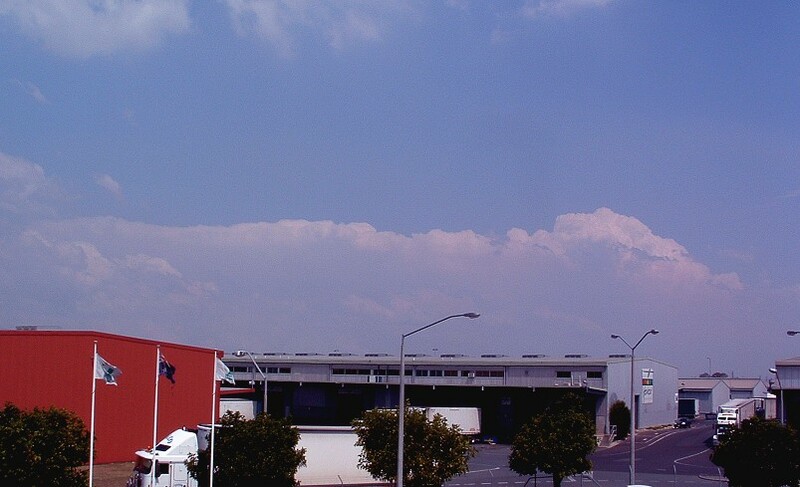 This location was ENE of a large hill and given the fact that the cell core came from the SW maybe this hill give some extra orographic lifting to add to the hail size." 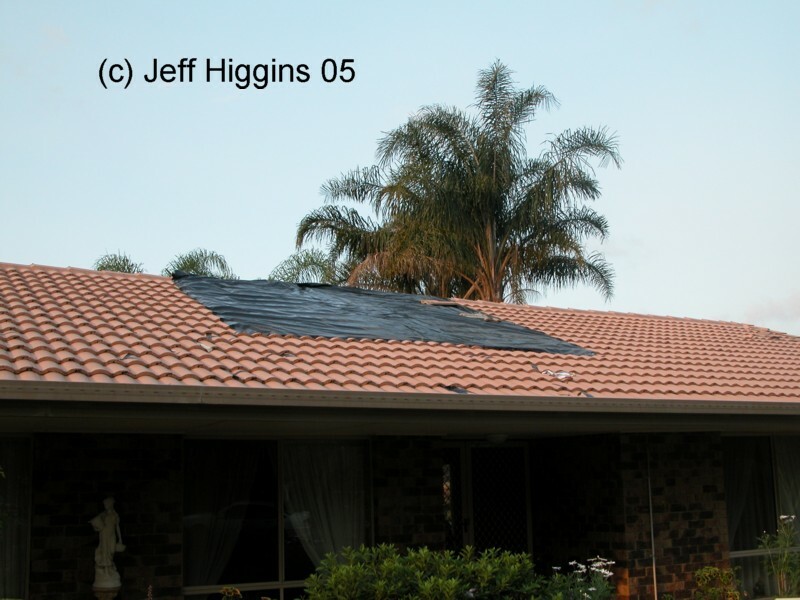 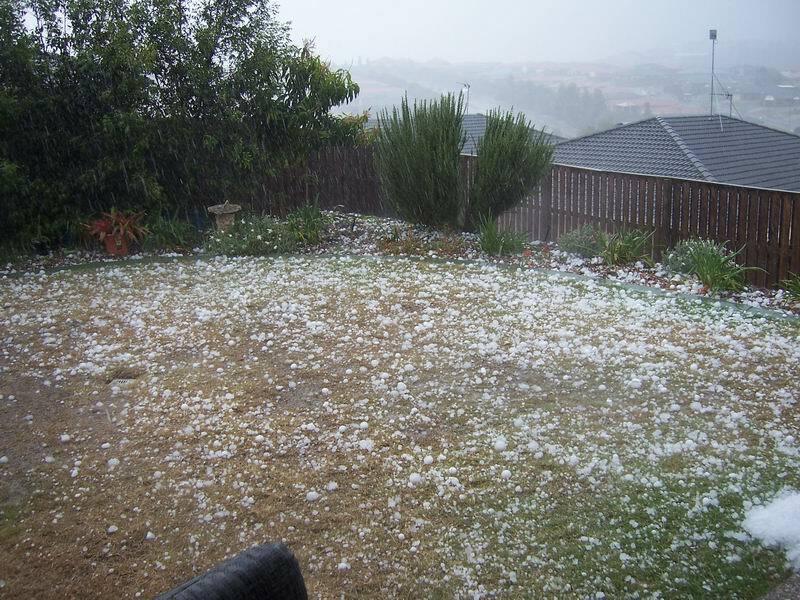 "Leanne at our Coomera home was a further 1.5 km to the NW and she recieved white-out rain and very strong winds. 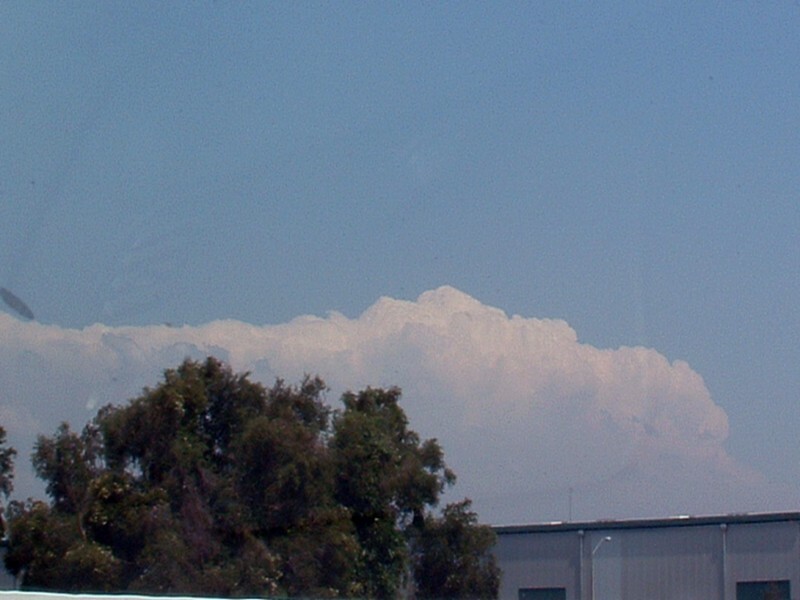 She also reported insane greenage and even a deep blue tinge to the clouds. 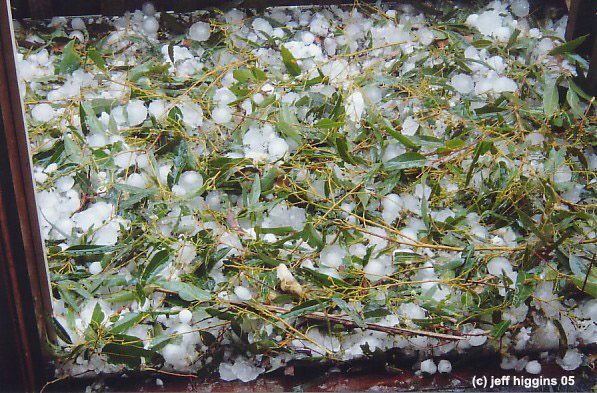 At Mt Tambourine trees were totally stripped by 5cm+ hail in large quantities - this matches the radar image at the time quite well."